The watchmaker's loupe aids the eye in focusing at a close distance for long periods without strain. 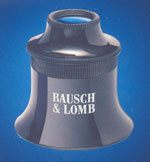 We feature eye loupes by Bausch & Lomb because they are ground and polished from the best optical glass. Single lens watchmaker's loupes by Bausch & Lomb are engineered with one solid lens. They are well-suited to applications that do not require color correction. They exceed the quality of most other eye loupes because they both avoid distortion of the image and they are economical. The chart below describes the different magnifications and focal lengths that are available. Double lens loupes consist of a single fixed lens that is not removable, as well as a second removable lens of a different power that attaches and detaches. The second lens is housed in a bezel that screws on or off from the main body of the loupe. Aligning two lenses of different power results in a combined magnification so that the eye loupe performs like a microscope. The loupe achieves this powerful affect without significantly diminishing the field of vision. The second focal length listed below is the combined focal length of the two lenses. 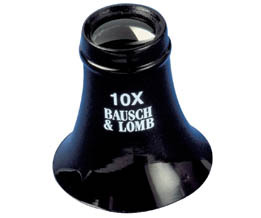 Bausch & Lomb makes a watchmakers loupe that contains a Hastings triplet lens. The Hastings Triplet lens is a composite three lenses precisely engineered to eliminate distortion of color and to provide acuracy of the image even around the periphery of the lens. 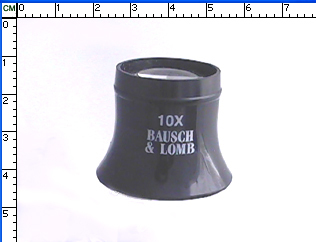 Each watchmaker's loupe on this page is compatible with the Bausch & Lomb head band for watchmaker's loupes. Provides a comfortable, "no-squint" solution. The head band is made of rubberized fabric which affixes at the back of the head using a convenient, hook-and-loop fastening system. Watchmaker's loupes are an inexpensive way to work at close distances with precision.